The Shores has been cut off from the rest of Prince Edward Island after a chunk of ice removed the only land link. The village is even more isolated than it ever was. It's the perfect place for a wealthy aesthete to hide away from the world. The entire village is nosy curious about their new neighbour, even though he wants nothing to do with any of them. Even local writer Hy can't help herself and peeks in his windows. Hy really needs to meet her deadline for the Super Saver and finish her article on how to cook lobsters. She also needs to find a speaker for the Women's Institute meeting she's hosting. To kill two birds with one stone, she invites who she thinks is an expert on lobster cookery but in reality is part of the Lobster Liberation Legion, a group devoted to lobster rights. This does not go down well in a town dependent on the lobster fishery. To make things worse, the lobster lover won't leave. If Hy ever wants to face the Women's Institute ladies again, she'll have to get the lobster lover out of the village. It won't be easy since 'that woman' has plans of her own, plans that will get Hy entangled with poachers, vandals and maybe even murderers. 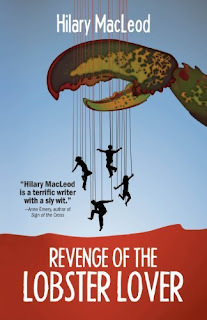 It took me awhile to get into Revenge of the Lobster Lover by Hilary MacLeod. The story starts out slowly and it gets a bit complicated. MacLeod also tends to make asides that I found distracting and pulled me out of the story. However, I was pleased at how everything came together in the end. I was also impressed with the characterizations. There are a lot of characters in Lobster Lover, a whole village, but each one has their own particular quirks. And I want to know more about them. I want to know what will happen next to Hy, Ian, and Gus. Will Moira ever stop courting Ian? Will we get to see more of dedicated Mountie Jane Jamieson? I guess I'll find out when I read Mind Over Mussels. If you like mysteries with a salty flavour, you might like Revenge of the Lobster Lover. I chuckled when I read Lobster Liberation Legion. This book sounds like it might be quirky enough to be fun. Heh. I like the nosy = curious bit. Sounds like this was good fun and captured your interest enough to pull you towards the next in the series. What an interesting title and cover. Interesting premise, too. Sounds like a fun read. Reminds me of those funny movies from the 70's where a lot of wild and zany stuff happens. That is one awesome cover. I'm not a mystery reader, but I'm tempted by the quirky factor. Kathy- Yeah, it's pretty funny. Buried- Hopefully the next in the series will be even better. Ti & Bookfool- I love the cover! Not something I would normally read, but I have been neglecting my Canadian authors this year.... I will have to give it a read! This is very odd, but intriguing! Think I'll wait to see what you think of the 2nd one too ... I love the title and cover though!